American Textile Recycling Service challenges Rock ‘n’ Roll Dallas marathoners to set a new record by donating running gear at the upcoming race. We are just blown away by the many dedicated runners at each event stopping by with bags of shoes and apparel for recycling! 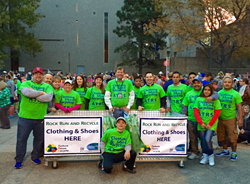 American Textile Recycling Service (ATRS) is proud to celebrate its fourth consecutive year as the official textile donation partner of Humana Rock ‘n’ Roll Dallas Half Marathon. To date this partnership has successfully diverted thousands of pounds of donated running gear from local landfills, including a record-breaking year in 2015. Participants are challenged to reignite their healthy new year's resolutions and help surpass that number this year by discarding warm up layers along the scenic streets of Dallas. ATRS kicks off Race Weekend by joining over 75 exhibitors at the Health & Fitness Expo March 18-19. Runners, spectators and attendees are encouraged to stop by Kay Bailey Hutchison Convention Center Booth #316 to pick up eco-minded swag, snap a selfie with the Recycling Fairy and donate gently used, unwanted running gear. Along with its popular I Heart Recycling stickers for the kids, ATRS will also be debuting an all-natural mini lip balm that is the perfect way to stay hydrated on the course! On Sunday, ATRS employees and volunteers will be on the course bright and early clad in signature green Clothing & Shoe Recycling tees. The Green Team will collect all warmup layers including gently used sweaters, jackets, hoodies and gloves dropped by runners as the half marathon begins. Every donation not only keeps unwanted textiles out of local landfills and lowers the carbon footprint of the race, it also raises much needed funding for Children's Medical Center, a Dallas area hospital networked through Children’s Miracle Network. Now in its fourth year, the Rock Run Recycle Campaign provides easy, convenient onsite donation options for marathoners and participants to run clean, run green at the race while supporting a local charity. "Rock 'n' Roll marathoners are passionate environmental advocates with a natural connection to the outdoors," says Debra Stevenson Peganyee, CMO for ATRS. "We are just blown away by the many dedicated runners at each event stopping by with bags of shoes and apparel for recycling before shopping for new gear at the Expo." Attendees do not have to limit their green movement to Race Weekend. Rock ‘n’ Roll participants and community members in 10 states across the nation can make clothing & shoe donations a year round habit by finding a nearby neighborhood donation bin. Simply call the ATRS 24-Hr Hotline 866-900-9308 or visit http://www.atrscorp.com. American Textile Recycling Service (ATRS) is the nation’s fastest growing textile recycler and an official recycling partner of Rock ‘n’ Roll Marathon. Its socially responsible business model provides free textile recycling solutions for the public, job stimulation worldwide and much-needed funding for worthy local charities. Easy, convenient ATRS Donation Bins are available throughout Texas, Colorado, Florida, Michigan, Tennessee, Atlanta, Oklahoma, Arizona, Indiana and Southern California. ATRS is committed to keeping textile waste from local landfills and promoting a greener tomorrow. For press inquires contact pr (at) atrsonline (dot) com.